Smaller and Smaller, a Look at Diminishing Effects. A theme that pops up quite often in the old catalogues is the idea of an object gradually shrinking before vanishing entirely. Perhaps the most popular of these tricks, and one regularly performed today, is the diminishing cards. In this effect a group of cards is removed from a deck and fanned. The fan of cards then decreases in size incrementally before disappearing. The set on the left is by Davenports, I'm unsure where the set on the right comes from. In both cases the largest card is the standard poker size, which gives an idea of how small the cards end up. The Davenports set is threaded together, allowing for more natural fanning than the riveted set. A variation on this theme is the diminishing billiard ball, popular when billiard ball manipulation was common on the stage. These two sets are likely from Germany. The left set shows the different sizes and the one on the right shows how the balls nest. Even less popular than billiard ball manipulation today is pocket watch manipulation. 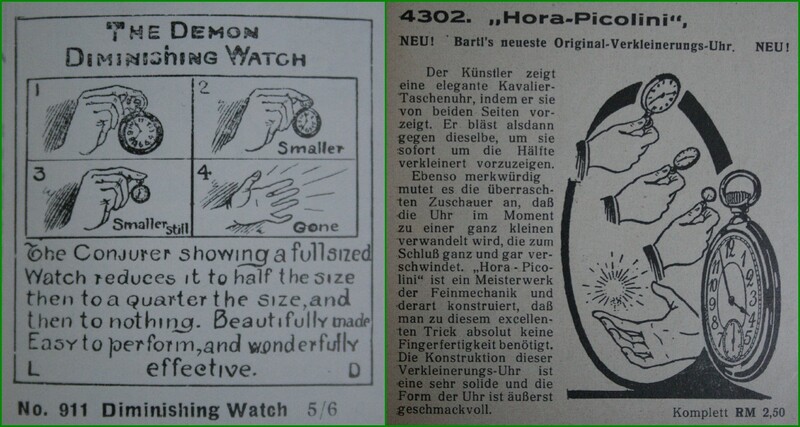 Here are two adverts for the diminishing pocket watch. On the left is the Davenports advert for the effect, the right is a Janos Bartl advert. Bartl manufactured these watches in Hamburg. This set is beautifully made. There are small brass nubs in the centre of each face to ensure the printed faces aren't rubbed off when the set is opened and closed. Here's an effect I'm going to shoehorn into this post, it's not strictly a diminishing effect. The trick, know as Multum In Parvo (a great deal in a small space) allows a quantity of milk to increase and then diminish again. The unusual thing about this example is that, unlike most sets, it is made entirely out of glass. The gimmicks being specially blown for each vessel. I'm not sure who produced it, but the quality is superb. This doesn't have the kicker ending where all glasses are filled from the jug at the end, the milk is simply poured back from the jug into the smaller glass giving the effect of a sudden decrease in milk. This is by no means a complete list of diminishing tricks, match boxes, coins, cigarettes and many other items have been included in similar effects. It's always fascinating when you open a magic book and find in it a book plate or signature of a previous owner. Sometimes there's a label or stamp showing which shop sold the book and in this post I'm going to look at some examples of these. Working roughly chronologically here is an ink stamp from Blands. This stamp shows Bland's address from approximately 1885. Hamleys later bought out Bland's but here is a label from one of Hamley's other shops from before the takeover, 229 High Holborn. In this 1893 edition, the label has been used to cover up the publisher's printed address. This common trick is used to try and ensure the customer returns to the magic shop for more books instead of buying direct from the publisher. The catalogue page has also been pasted in the book and wasn't part of the original binding. This paper label is later and was found in a copy of Hoffmann's Latest Magic, so it's probably from 1918. Later again is this purple ink stamp found in Percy Naldrett's 1925 book Volume Six. Jumping far ahead in the chronology for a moment here's a much later Hamleys sticker. This is from a 1941 copy of Eric C. Lewis' Studies in Mystery. 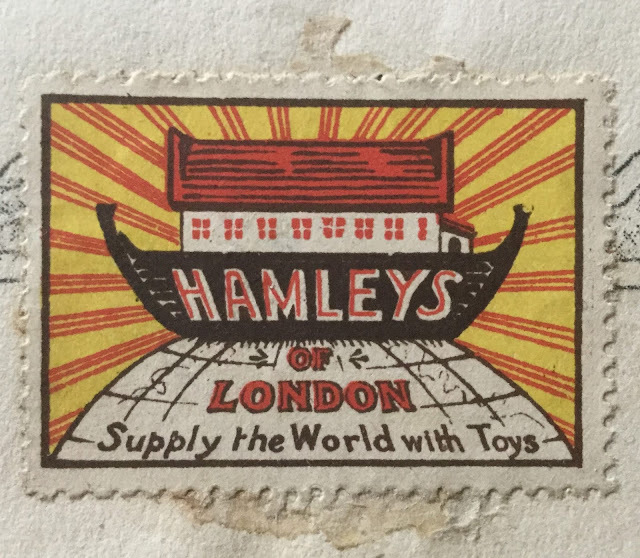 By this time Hamleys was predominantly a toy shop, as it is today. This label appears to have been pasted on after a circular one had been removed, most likely one of the gold Davenports labels mentioned later. Returning to the early twentieth century, another big dealer of this period was the department store A. W. Gamage. They often put small paper labels in the inside covers of books. The one below is from a 1904 edition of Hopkins' aptly named Twentieth Century Magic. In 1905 Will Goldston began managing Gamages' conjuring department. Here's a label from around 1910, during Goldston's time there. Goldston left Gamages in 1914 to establish his own magic shop. This 1917 edition of Supplementary Magic by Elbiquet contains one of Goldston's paper labels. Looking at a smaller dealer now here's a stamp from a 1909 edition of Some Modern Conjuring by Donald Holmes. I'm not familiar with Maddock, mentions of him are scarce. According to Genii's Magicpedia his real name was Jas. W. Bell and Fergus Roy mentions him as a relatively large dealer in The Davenport Story, Vol. 1. Speaking of the Davenports, their labels crop up very often, particularly their seal-like paper labels. In this example a solid ink stamp has been used alongside the seal to discourage customers from buying direct from Burling Hull. This seal is perhaps the most common and shows the 15 New Oxford Street address they held between 1915 and 1937 (for a list of Davenports' addresses and when they used them see the FAQ section on the Davenport Collection website). Here is a clearer view of a similar seal. There are also at least two gold versions of this seal. This one shows their address from 1938 to 1942. This label wasn't from a book, but from the inside lid of a Sand and Sugar can. They also produced a gold label with no address on, instead it simply had Made in England written around the edge. This label was found pasted in a book from 1945. Often, and understandably, some magicians weren't best pleased with having labels pasted in their new books so it's not uncommon to see evidence of their removal. Slightly later than the above, Willane's Wizardry was published in 1947. 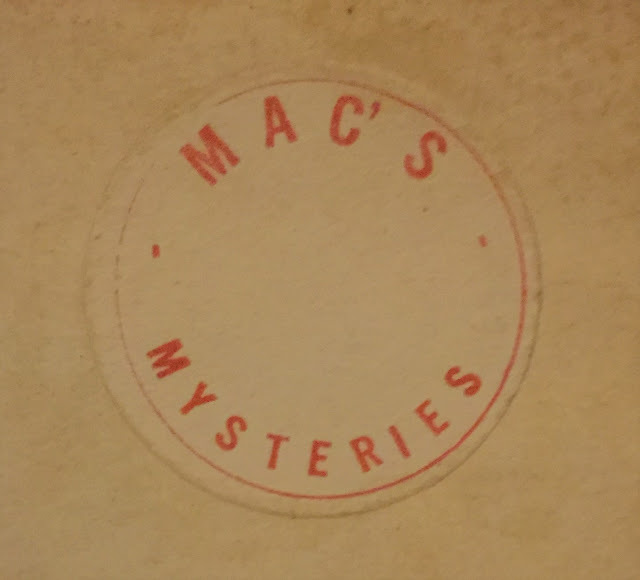 This copy has a label affixed from George McKenzie's Mac's Mysteries. Many dealers sold second hand books and fixed their labels in many years after the book's publication. As such we can't be sure the labels are as early as the book they are in. Here's one such example form a 1930s book. The famous escapologist Murray sold magic items and jokes after poor health prevented him from performing. This list is updated from time to time as I stumble across other labels amongst my books.